Standing in the Court of Ramesses II, number 2 in the diagram, looking back and east. This shows all of the different 'gods' depicted in statue. One of the many reasons modern archaeologists have had such a hard time attempting to discern the true meaning of ancient Egyptian culture is that the ancient Egyptian's thought processes have turned out to be so completely, radically different from our own. Many of the modern scholars, indeed, most, are still unaware this is the case. After spending 15 years deciphering the ancient Egyptian's thought processes, Schwaller de Lubicz apparently felt that he had made his case: that those who wish to understand the true meaning of this and other Egyptian Temples must learn how to think as the ancients did. However, the implications of what Schwaller de Lubicz found were so far-reaching and threatened so much existing theory that he has been largely derided or ignored. However, even has they deride him, his scholarship has been so good that none of his critics has so far come forward and disproved any of his findings. 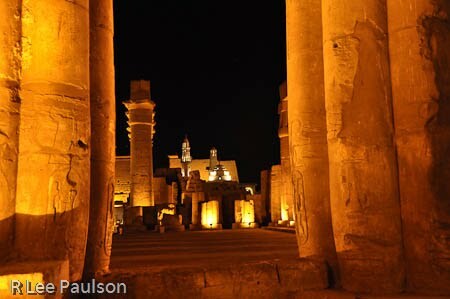 Standing in the same place but this time looking toward the back of the temple through the colonnade. John Anthony West, our guide, pictured earlier, has made nearly a life long study of Schwaller de Lubicz's discoveries about this temple. 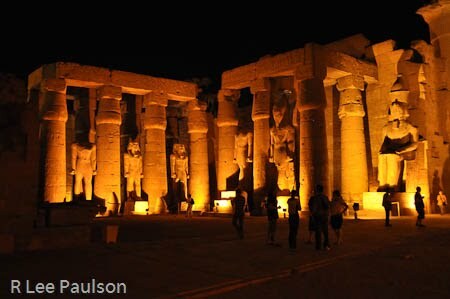 In Serpent in the Sky, West says, "The Temple of Luxor is not...a stone equivalent of the laboratory skeleton. Rather it is a symbolic model which conforms to scale. "In one sense it is a library containing the totality of knowledge pertinent to universal creative powers. This knowledge is not set down explicitly in books, but is embodied in the building itself." 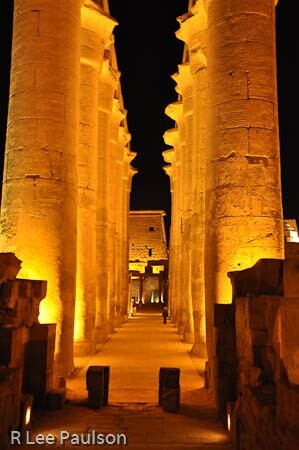 I have walked through the colonnade and am looking back toward the front of the temple. West continues in Serpent in the Sky, "The walls, colonnades and sanctuaries all correspond to the siting of the various vital centers. (We've already discussed this.) Schwaller de Lubicz examines in detail contemporary studies of biometrics (the study of human measures) and finds these correspond very closely to the measures consistently employed in Egypt. These measures he shows conforming to a formal canon; proportion was never a matter of individual artistic preference." 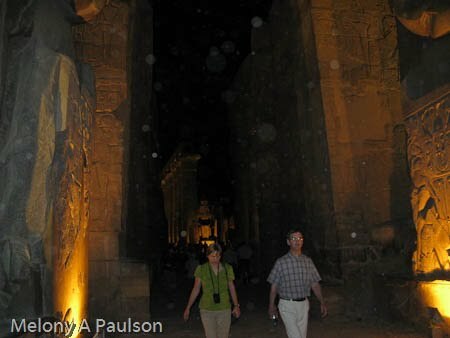 I've now walked farther back into the Peristyle Court of Amenhotep III and am looking toward the front of the temple. Notice towers to the right of the colonnade. Those belong to a mosque (Mosque of Abu el-Haggag) that was built and re-built on the site beginning, it is thought, around the 11 century AD, when the Luxor Temple was mostly in ruins. West continues, "Thus the various sections of the human body stand in complex but always harmonious relationship to each other. And the discrete phases of growth also stand in the harmonious relationship to earlier and later states. 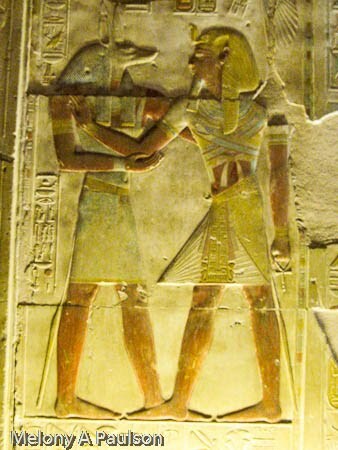 "These relationships are incorporated into the proportions of the Temple itself, in the proportions of the various wall paintings and statues. And the symbolism of each section corresponds to the organic vital center represented by that section. Sometimes direct and unmistakable, sometimes extremely subtle, this symbolism takes many forms...nothing is the result of arbitrary choice, individual caprice or even aesthetic preference." A closer look at the mosque from back a little further. Ahh the joys of a telephoto lens. 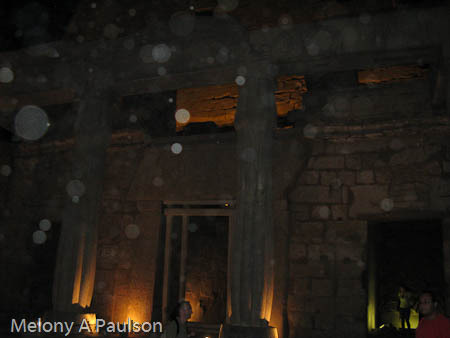 Notice the two broken, lighted columns in this image. 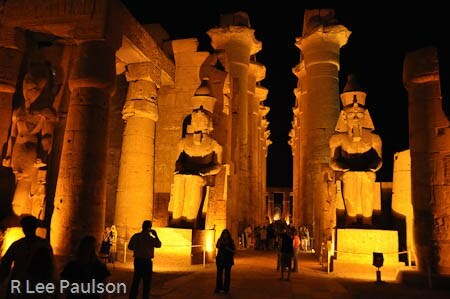 They are the same columns shown in the photo above toward the back of the court yard. West continues, "The siting of the Temple, its exact orientation,its foundations and the manner of construction of the foundation--all are dictated by symbolic considerations, not by economy. Egypt transported granite obelisks a thousand miles down the Nile in order to conform to the fire symbolism of the obelisk. "The coursing of the stones itself, the placing of the joints and the size and shape of the blocks employed were part of the grand symbolic design. 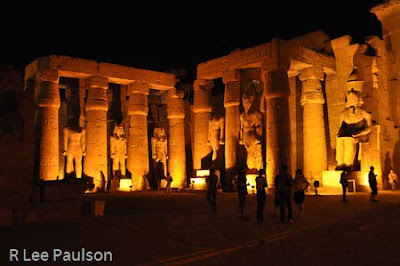 The bizarre, time-consuming and structurally unnecessary stone masonry has long puzzled Egyptologists, for there is no logical, practical or economic explanation to account for this consistent practice." 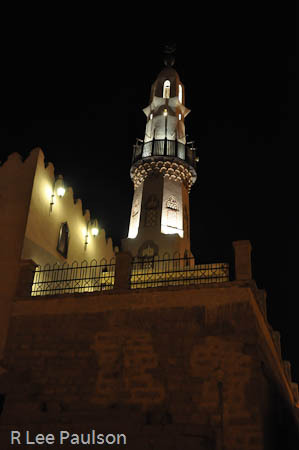 The minaret of the mosque. West continues, "Meanwhile, the dimensions of the Temple resolve themselves into fractions of terrestrial and cosmic measures (as do the pyramids). Because the whole of the Egyptian system of weights and measures was based upon terrestrial and cosmic considerations, the dimensions take on different significance when calculated according to the different measures, such as the span (our fathom), the royal cubit and other cubits. No doubt the total volume of the Temple had some cosmic significance as well." 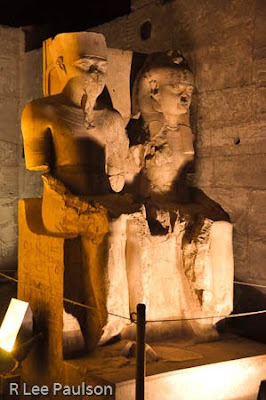 I found this damaged but sweet sculpture of pharaoh and the goddess enchanting. West then goes on to talk about in one example how the Egyptian art and architecture used a set of grids, much in the same way we use graph paper in order to establish proportion and scale. (Knitting and weaving patterns are often drawn up in this way.) While a knitting pattern we might use a decimal measuring system of eighths or sixteenths, the Egyptians used a grid with 19 squares, or a rectangle dimensioned 18 by 19 squares. From our perspective, 19 is an odd number to choose. However, according to West, "The system of proportion based upon a grid 18:19 was in use at the very beginnings of Dynastic Egypt." --five thousand years ago. Notice her hand around his back, imparting to him her qualities and strength. "Schwaller de Lubicz demonstrates the remarkable Pythagorean properties of the number nineteen, and particularly of the fraction 18/19, in biometry; nineteen also relates to cosmic measures, to the cycles of time, and to the twelve signs of the zodiac." Bottom line, the ancient Egyptians not only had their symbolic reasons for using 18:19 proportioned grids, but those reasons were backed up solid mathematical theory and the laws of harmony. It turns out that Babylonian and Mayan art was also laid out on a grid of 19 squares. An interesting coincidence, and a discussion for another time. In another example, West says, "The Royal Apron is characteristic of Egyptian art. Schwaller De Lubicz carefully measured seventy two of these aprons--almost all of them within the covered Temple of Luxor--and found in every single case that the aprons were constructed according to precise mathematical considerations. In each case, these proportions corresponded in some way to the mathematical relationships of the mural of which the royal personage was a part." 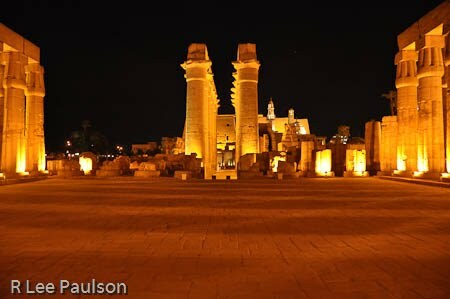 Melony took these two shots at the Luxor Temple. Notice the 'bubbles' floating around the images. Other folks on our trip experienced similar phenomena with their cameras as well. We have no idea what causes them. We could find no rhyme or reason for when they appeared. These two of Melony's are separated by 25 shots, give or take. I could go on and on attempting to show you examples of the subtle symbolism, combined with the extreme, fanatical care used to bring that symbolism into form in this and, presumably, other ancient temples. But I think you get the idea . My purpose isn't to 'prove' anything with these posts, more it is to whet your curiosity, if only a little. And, to make you question everything you've ever been taught about Egypt...and...maybe do a little investigating on your own. 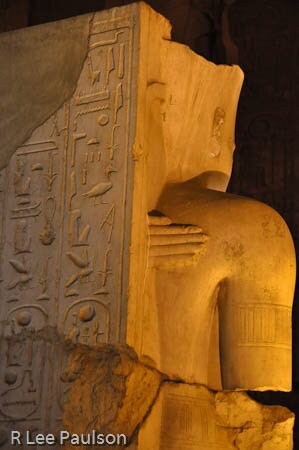 Because, if Schwaller de Lubicz is right about the amazing breadth and depth of knowledge possessed by the ancient Egyptians, and after seeing all of this in person, I believe he is, then the currently accepted theory of who we are as a civilization, and where we came from, needs revising. Continue on to Post 17: a Digression by clicking here.